This step-by-step Australian visa guide covers both Tourist and Business streams, the visa requirements, and the entire online application process. Last updated: April 6, 2019. One sure way to make us smile is to mention Australia. Whenever a friend asks us a simple question about our time there, we can’t seem to stop talking passionately. Australia is incredible. It may be the world’s smallest continent, but it is teeming with adventures. 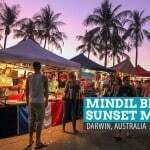 Within a month, we were able to visit four cities (Darwin, Sydney, Cairns, and Brisbane), three towns (Alice Springs, Yulara, Airlie Beach), and five national parks (Litchfield, Kakadu, Wattarka, Kata Tjuta-Uluru, and the Great Barrier Reef). It is the most unforgettable trip we have been on to date, and we can’t wait for our readers to experience what the Land Down Under has to offer. Fortunately, it is easy to get an Australian tourist visa. While you can still apply via VFS Global, a more hassle-free way is to do everything online. I’ve done this three times for myself and several times for my friends and family. 1. Sign up for an ImmiAccount. 2. Accomplish the Application Form. How long is the processing time for Australian Visa (Tourist or Business)? How long is the validity of the Australian visa? How early should I apply for an Australian visa? What is the Grant Number in the application form? In the application form, what should I answer to the “Any Significant Date” field? Is Australian visa GROUP APPLICATION possible? I’m traveling with family. Do all of us need to sign up for an Immi account? What to answer to ‘Other Passports or Documents for Travel’ and ‘Other Identity Documents’? I don’t see any section for TRAVEL HISTORY in my UPLOAD DOCUMENTS page. What should I do? I’m being asked to submit Form 956A. What is it? I can’t type properly on Form 54 (Family Composition). What to do? I can’t sign Form 54 (Family Composition). How do I add my signature? 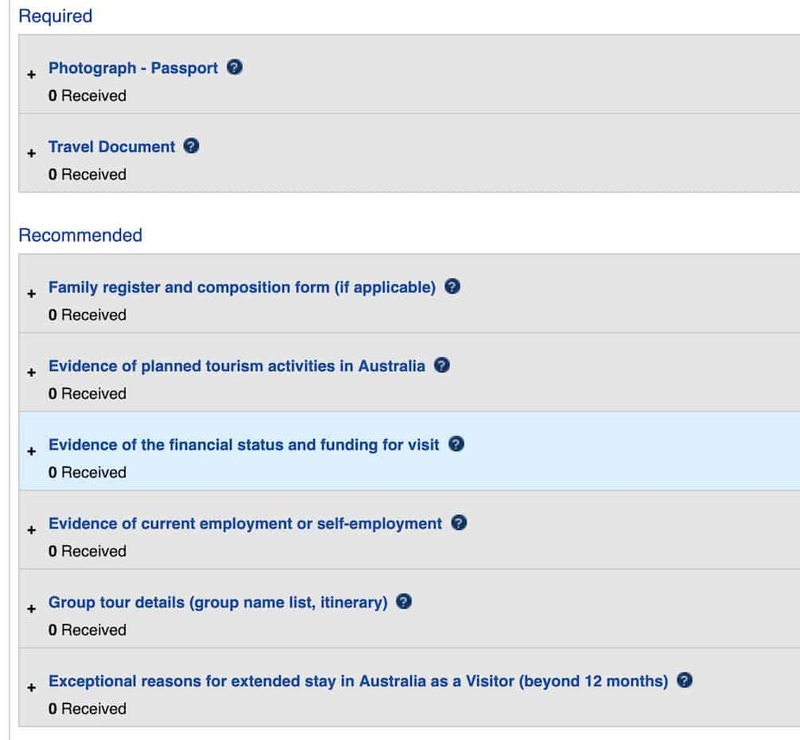 Can I apply for a multiple entry Australian visa? 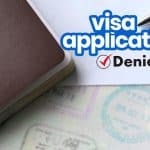 Can I be granted a multiple entry visa even if I only applied for single entry? 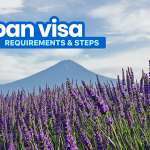 Can I be granted a multiple entry visa even if I’m applying for the first time? What are the reasons why my application would be denied? What to answer to the part of the form about NON-ACCOMPANYING MEMBERS OF THE FAMILY UNIT? Do the documents have to be notarized? Does Australian Immigration still stamp passports? Can I request for an entry stamp? Where do I attach or upload the cover letter? What does an Australian Visa look like? 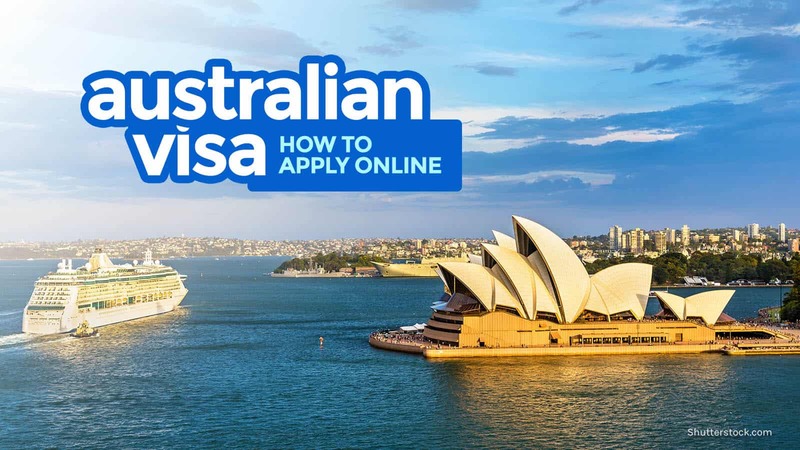 This guide is for those applying for an Australian Visitor Visa (subclass 600) online. Under this visa, there are two main streams: Tourist and Business. Tourist Stream. 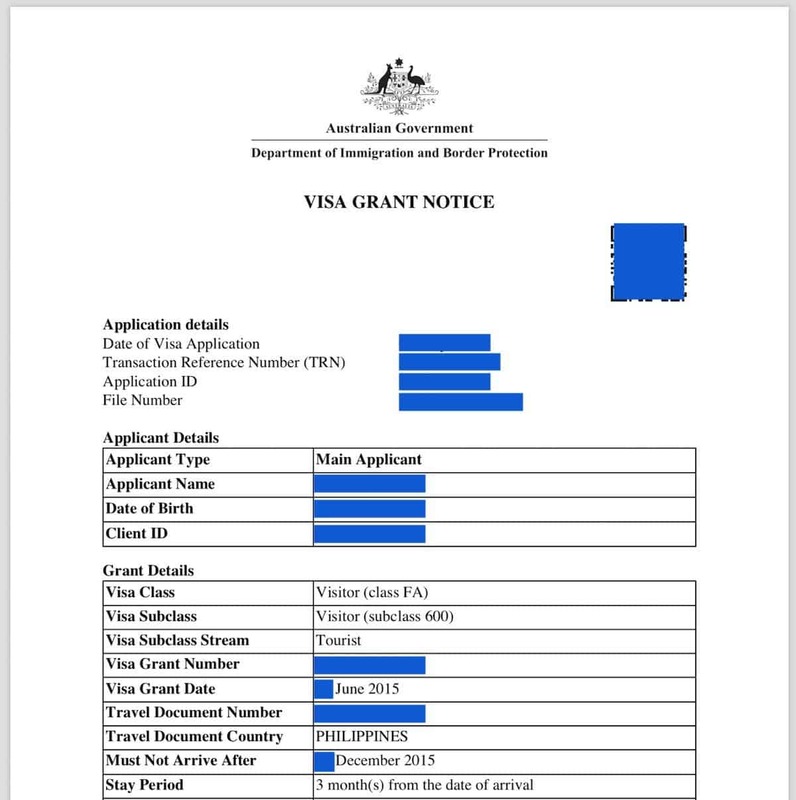 According to VFS, a tourist is a person visiting Australia temporarily “for a holiday, for a visit to relatives or friends, or for other short-term non-work purposes, including study for less than three months.” This stream applies to people who will be shouldering their own expenses and have no sponsors. Business Stream. This type is for those who are flying to Australia for a business-related activity like attending a conference or meeting a client. This is different from a Work Visa, which we know nothing about. To clarify: If you’re visiting a relative or friend but you will shoulder your travel expenses, you will still fall under the Tourist Stream. But if you’re sponsored by someone in Australia, there is a separate category for that: Sponsored Family Stream. We haven’t tried this stream yet, so we’re not covering that in this post. Accomplished online application form. No need to print anything. You will be filling this out after creating an account. The form has 20 pages, so completing it can take a while, but it’s easy. Copy of passport info page. Scanned. Must be clear. Evidence of Applicant’s Previous Travel. You may be asked to provide scanned copies of the pages of your OLD and CURRENT passports that have entry and exit stamps and visas. Not all applicants are required to submit this. Family Register and Composition Form. – Marriage Certificate. If your current last name is different from your last name in your birth certificate. – Day-to-day itinerary (daily schedule showing the places you will visit and things you will do). Sample itinerary here. Visa Fee (AUD140). Credit card, debit card, PayPal, and UnionPay are accepted. Cover Letter. This isn’t required, but it would help you a lot if you upload a letter explaining why you want to visit. Make sure that the letter summarizes and supports everything else you’re submitting. Remember, there will be no interview so it is best to let them know what you plan to do in Oz. We have a sample here: AUSTRALIAN VISA COVER LETTER. Roundtrip flight and hotel booking. You are actually discouraged to book flights and hotels before you’re granted a visa (so your money won’t go to waste should your application be denied), but in our case, we already had confirmed bookings so we thought we might as well submit them. This might be helpful if you snagged low fares via seat sale. But if you don’t have tickets yet, don’t book. Wait for your visa before making flight arrangements. I know friends who also submitted their latest credit card statement. This is to show them that you have additional source of travel funds. I have a credit card but didn’t submit mine. 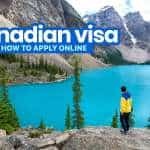 Again, if your trip is sponsored, apply for a visa under Sponsored Family Stream. Unfortunately, we haven’t experienced it so we don’t know the details. But from what I know, you will need to have the following on top of the other requirements. Letter of invitation. Only if you’re visiting a friend or relative. Best if you have photos with that friend and relative showing that you really know each other. Identification Documents of Sponsor. If you declare that your trip will be paid for by someone other than yourself. Evidence that your sponsor in Australia can financially support your trip. If you declare that your trip will be paid for by someone other than yourself. Your sponsor might also be required to pay a bond. On the list above, I keep on writing “ANY or ALL of these documents.” Why? Because in theory, you can submit just one item per document type. But of course, the more relevant documents you upload, the higher your chances of your application being approved. The following file types are accepted: jpg, bmp, png, pdf. PDF files must NOT be encrypted. Zip files are not allowed. The size of each file must not exceed 5MB. If it’s bigger than that, you will need to reduce the size. If your PDF files are still over, recreate your files with Adobe Distiller and set to “lowest file size.” Jpeg files can be set to only 96 DPI (dots per inch). 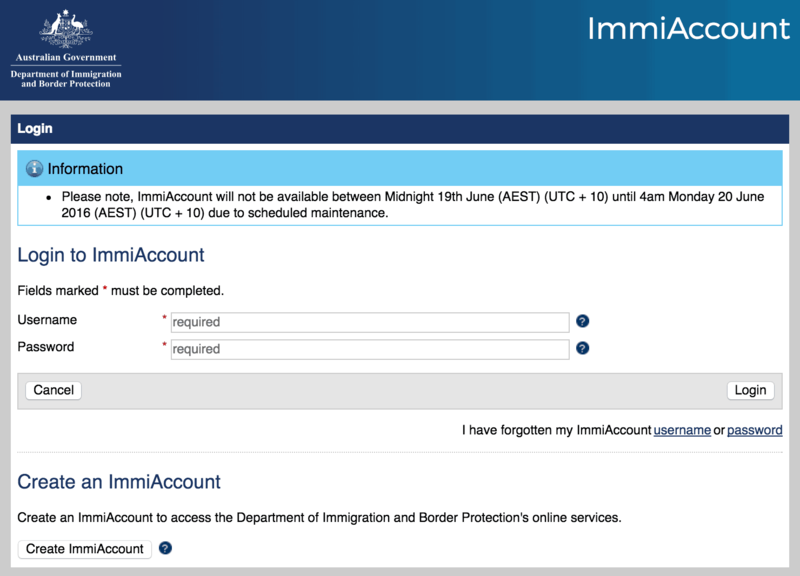 ImmiAccount means an account with Immi.gov.au, the Australian government’s official Immigration website. It is important to create an ImmiAccount because the whole process will be done on this website. Important: Make sure you use a working email address. Any update about your application will be sent to this email (including the acknowledgment of receipt of your application and the actual visa grant). You will also get notified every time you log into your account. Once you have an account, you’ll receive a confirmation link via email. Check your inbox and follow the link. Click on NEW APPLICATION. Here, you’ll be asked what type of visa you want. Click on VISITOR. Then choose Visitor Visa (subclass 600). For tourists, this is the equivalent of Form 1419, except you don’t need to print this out. Continue filling out all 20 pages of the form. What if you start accomplishing the form but can’t complete right then? It’s okay. You can SAVE the changes and continue editing in the future. As long as you SAVE it (and NOT SUBMIT), you can keep on editing the form. DO NOT SUBMIT THE FORM if you’re not done yet. 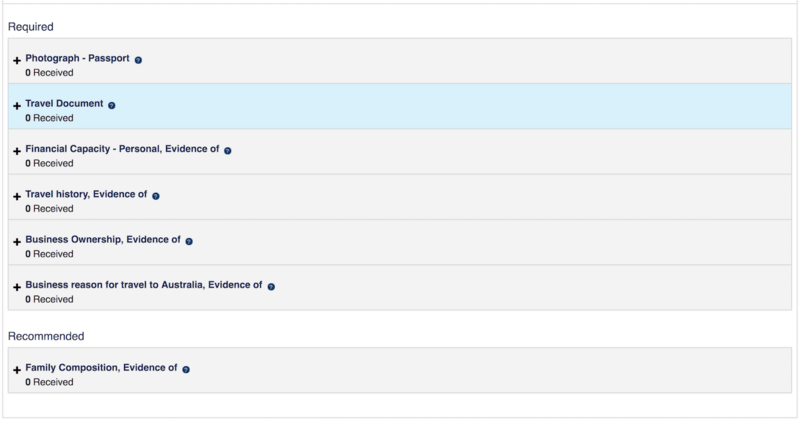 On your application dashboard, you will find a field where you can upload the required and recommended documents. The key is to submit as many types as you can. Better safe than sorry. You can see the list of requirements above. This is what the UPLOAD DOCUMENTS page looks like when applying for a TOURIST STREAM visa. Some applicants will see an additional EVIDENCE OF THE APPLICANT’S PREVIOUS TRAVEL field. And this is for BUSINESS STREAM. The Document Attachment page for Business Stream Applicants. I applied for business the second time. First time, tourist. That’s it! Once you have submitted your application, you should receive an Acknowledgment of Application Receipt in your email. I got mine on the same day of submission. From here, it’s gonna be a nerve-racking waiting game. Note that they will never give you an update from the moment you submit until a decision is made. This means that the next email you’re going to receive from them will tell you whether you have been granted or denied a visa. Online payments are done via credit card only. If you don’t have a credit card, you can ask a family member or a friend who has one. You can also use PayPal and UnionPay. The processing can take as short as 24 hours to as long as a month, depending on your case. The first time I applied, the process took almost a month. I submitted my application on May 9 and received my visa on June 5. This was in 2015. The second time, it took 7 days. Submitted the application June 21 and got my visa on June 28. My teammates had it shorter. They got theirs in 5 days. Some of my friends got theirs in less than 24 hours. It’s pretty hard to predict. The third time, it took 8 days. My mom, who was applying for the first time, had hers in 8 days too. In my case, even though I applied for a 3-week stay, I was granted a visa valid for 3 months. I think that’s the standard length for non-working visas. Not earlier than 6 months before your trip. In the visa, the last day I can enter Australia was clearly specified: 6 months after the visa was granted. Again, I’m not sure if this is the case for everyone, but that’s what was indicated on mine. No one knows exactly. They don’t explicitly say. But to give you an idea for a ballpark figure, the Embassy of France now requires from Schengen visa applicants EUR 120 per day of stay. If it’s your first time applying for an Australian visa, choose NO. If you’ve been granted a visa before, choose yes and enter the number. You’ll find the Grant Number in the Grant Notification for your previous visa. 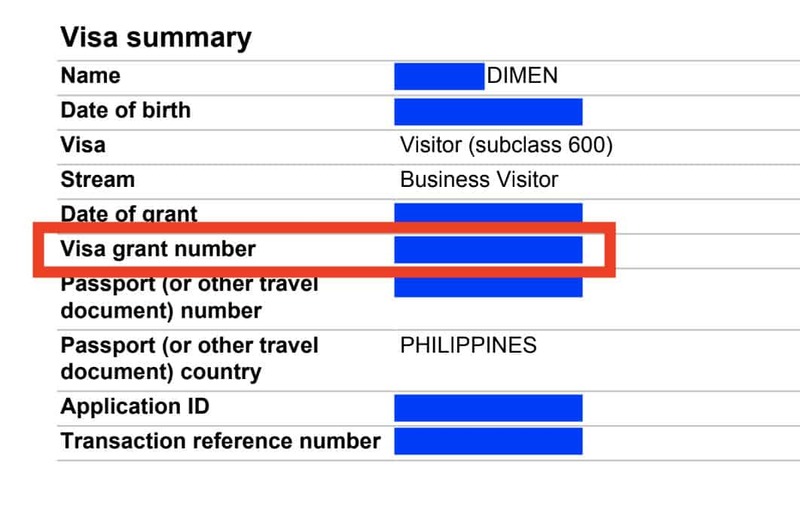 Here’s where I found the visa number on my previous grant notification. If there are specific dates when you need to be in Australia, write them down. For example, if you’re attending a wedding, enter the wedding date so they can consider it for the validity of your visa. Same with attending a conference/seminar. Enter the conference date. Likewise, if the main purpose of your trip is to be at a concert, enter the concert date. If you have no significant date in particular — say, you’re simply sightseeing or touring — you can skip this part. I’ve done Australian visa application three times now. In my first and third application, I answered NO because I will be sightseeing and my dates were flexible. In my second application, I was flying to Australia to attend a conference, so I entered the date of the event. Yes. 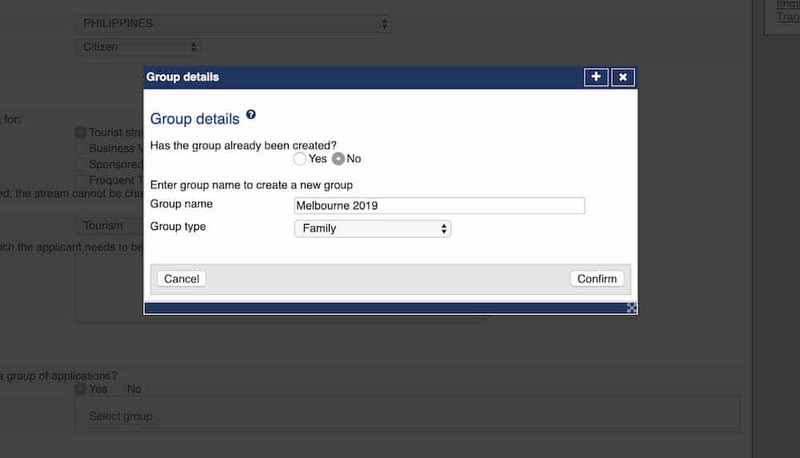 You can create a group on the dashboard (just click on “new group” and then take note of the group code) and then when filling out the application form, at one point you will be asked if it’s part of a group, click YES and choose the group you created or enter the group code. However, please note that even though you’re part of a group, your application will still be assessed individually. The decision will not be collective. Some of you may be approved, some denied. NO. One member can apply for the whole family. I’ve recently done this. I only used my ImmiAccount but created multiple applications using only one Immi account. For OTHER PASSPORTS OR DOCUMENTS FOR TRAVEL: If you’re like me who doesn’t own any other passport or travel document, then tick NO. For OTHER IDENTITY DOCUMENTS: I entered my Birth Certificate Registry Number and UMID Number. In my first two times applying for myself, the TRAVEL HISTORY or EVIDENCE OF APPLICANT’S PREVIOUS TRAVEL section was there. When I applied for my mom, who was traveling to Australia for the first time, it was there too. But when I applied for myself for the third time, that section is nowhere in my Upload page. I’m not sure when or in what instance does this section appear. But when I couldn’t find it when I recently applied, I uploaded the scans of my passport stamps it under the EVIDENCE OF THE FINANCIAL STATUS AND FUNDING FOR VISIT. I decided to still upload my passport stamps even though they weren’t asking for it this time because I believed this would strengthen my case. I decided to upload it under EVIDENCE OF FINANCIAL STATUS because to me it looked the most appropriate as it also shows that I can afford to travel in general, even in other countries. Form 956A is a document that grants someone else authorization to receive files from the Australian Government. In the Application Form, you will be asked if you have an Authorized Representative who would be receiving documents on your behalf. If you answer YES to this, you will be required to complete and submit Form 956A. I encountered this form when I was applying for my mother. My mom doesn’t speak or understand English. And being a senior citizen, she doesn’t have an email address and isn’t interested in getting one. Because of this, we decided to have me as the Authorized Representative and receive the documents on her behalf. Be careful when accomplishing Form 956A. This form is also used to withdraw authorization, so make sure you’re filling out the right sections and skip the withdrawal parts. The form has Chinese and English pages. Don’t worry about the Chinese page. It will mirror everything you write on the English page. If you’re using Mac, add your signature using the Annotate feature on the PREVIEW app. If you’re using Windows, use Adobe Acrobat Reader. It also has the same Add Signature function. I didn’t have to print it and scan it. I just affixed my electronic signature. I’m not sure if this is the right way to do it, but that’s what I did for my application, my mother’s, and my friends’. All of our applications were approved. This didn’t apply to me so I skipped this. I didn’t upload anything. If you’re visiting Australia for only a few days, I think this part is not applicable. Yes. On the application form, you will be asked whether you need to enter Australia more than once for that trip. If you want a multiple entry visa, declare it, but make sure you can justify and prove it. YES. In my most recent application, I applied for single entry but was granted a multiple entry visa. I also have friends who had the same experience. YES. I took care of the applications of my friends and my mother, who were all first-timers. They were all granted multiple entry visas even though they had never been to Australia before. My second time applying was funny. That time, I applied with friends who were all first timers. I was the only one in our group who had been to Australia before. When the results were released, I was the only one who had a single entry visa. Everyone else was a first timer but was granted a multiple entry visa. Sometimes, it’s really hard to predict. You can’t prove that you intend to return to the Philippines. You probably don’t have a stable job at this point or are newly employed or newly resigned, and it’s giving the impression that you plan on staying longer than your declared duration. You can’t prove that you can financially support yourself on this trip. You or your sponsor may not be in good financial standing. You seem to not know the details of your trip. You may have appeared as though you’re not really doing what you declared you would be doing, which may raise some red flags. Your purpose in Australia is unclear. This is why it is best to be specific when you’re detailing the reasons for your visit. According to the Australian Immigration website, a family unit is defined as a partner (married or de facto) and a dependent child below 23 years old. If you’re single, just tick NO. If you have a spouse or de facto partner or child, then choose YES and fill out the form that appears. Siblings (brother, sister), parents (mother, father) and in-laws are not covered by this. This is different from Form 54 (Family Composition). On Form 54, you need to include your parents and siblings. But on the the Page 9 of Application Form, the family unit refers to only the partner and dependent children. When I applied in 2018, nothing in the list of requirements indicated that the documents have to be notarized. I didn’t have ours notarized. But our application still got approved. You’ll know when you begin your application. It’s usually indicated on the application dashboard. By default, Australia no longer stamps passports. BUT you can request for it and they will give your passport a precious stamp. All you need to do is ask. In my case, I uploaded it under Evidence of Planned Tourism Activities > Others. This is going to help us so much with sorting out our Aussie visas! Thanks for the informative post guys, much appreciated. Hi! Im applying now and i cant find the proof of travel history part. My page isnt d same as the screenshot u provided. Do u know where should i add proof of my travel history? Thanks! What kind requaments for australian visa? What is a notarized NSO birth certificae? Is it the yellow green document? Also, what is a notarized passport info page? Is it a certified true copy that should be requested from the DFA? Just a follow-up question, do you mean that this is just a photocopy of the first page of the passport and then notarized and scanned? Scanned copy of your passport will do. That’s what I did in my application and they accepted it. Hi! Ive read through your article on AU visa and was wondering if having a Japan visa (recently expired) would be a plus? Yes, it can help you get better chances, but no guarantee. hi there, is it mandatory to notarized bio page and travel docs for australian visa? May I ask po saan po dapat i attach yung birth certificate dun sa immi account.Thank you. Yung saken, sa Evidence of Family Composition ko nilagay. HI how much is the minimum funds for the bank statement? Do you have any idea? Cheers. Hi, how about if someone’s going to sponsor you, with all yhe expenses such as tickets, accommodation and cost of living during visit period do you still need to show a bank statement? Or just the letter of invitation from your sponsor? Thanks! Hi, Do you know the minimum or ideal amount of funds needed in the bank for the ‘show money’? Cheers. hi, im over 18 and my dad is my primary source of income. ive never had a job before. how can i present that on the application. also, the website advises the documents added to the app must be in .bmp format, what kind of format were your documents (birthcertificate, passport)? thank you. You can state that your trip is funded by your dad. He needs to provide proof of income, etc. They allow pdf and jpeg as well. hi, i m a foreigner taking my masters degree in phillipines. i want to apply for australian tourist visa to visit my sister in australia during summer break. what additional documents do i need to submit? thank u po. If she is sponsoring you, she has to write an invitation letter, copy of her passport, proof of assets (title of house and bank statements). Given that you are a student, I would suggest asking your sister to sponsor the whole trip or make it appear on your visa application. Hi. 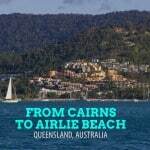 Is there a chance that I will be given a visa if my reason is to only travel for a couple of days in aussie but will be flying to another country with a multiple entry? My proof of evidence will only be the visa of that country and PH employment certificate (given that I recently resigned)? There is. Just make sure to create a comprehensive cover letter and include the details of your flights. Hello. I just want to confirm that the tourist visa is valid for 1 year upon approval. Thank you. Hi! Can i get a clarification… so the visa does not have a definite period, like from June 20,2017-August 20,2017? It will just say that the visa is good for so and so number of months? I am planning to apply for one soon, but would like to travel in December pa. Thanks! Depends on the visa granted to you. I think, the minimum is 3 months validity (single or multiple entry). If you will apply for a 12 month visa, I think you have to undergo medical exam. Hello. Is it okay to not present ITR since I’ve just resigned from my job. And AU will just be a stopover since Im going to another country..
Hi, did they get your biometrics or something? hello! should i just scan my passport including my past travels or do i have to photocopy it, notarized and then scan and upload on their website? thanks in advance. I have the same question, is it necessary for the documents to be notarized? Or are colored scans good enough? thank you! hi, is it necessary for the documents to be notarized as of this year, 2019? hello….do we need to get a travel insurance as well? is it a must/requirement? for the bank statement, how far historically should you show? 6 months? 1 year? My brother is applying for a tourist visa to join a competition in Aus. He is going to use my bank statement since he has no existing bank acct as of the moment. I was just wondering if you would know what other supporting documents do we need to submit just to be sure it gets accepted? Hi Camille, how old is your brother? Is he still a student? Hi Chabelita. I’m not that familiar with the requirements for visiting a resident in Australia as my experience is restricted to tourist and business. Hi Eleni! The visa we received must be used within 6 months of issuance. We applied in June and we needed to enter Australia before December. Hi! If I’ll apply for a family visa (group of 5), should I create an ImmiAccount individually? Also, I’ll be flying on Nov this year and my passport will expire Feb 2018, can I apply for a visa now kahit sa September 2017 pa yung schedule for renewal ko? Hi! I will be applying for an Australian visa next week. I am a student and okay lang ba if I show my bank certificate instead of bank statements as proof on how I can fund for my trip? Hi! I will be applying for an Australian visa next week. I am a student and okay lang ba if I show my bank certificate instead of bank statements as proof of how I can fund for my trip? Also, how much should I show if I will be staying for 1 week? I guess this comment is a week late, sorry. If you’re a student, how can you afford to go on a trip? Technically, you have no source of income. I would suggest asking your parents to declare sponsorship. Bank statement or certificate will do. As for the money, consider which state are you visiting. Some costs higher than the others. Check the hotel rates, activities you want to try and transportation. Make sure you have an extra money in case of emergencies. About the bank statement, did you just took a photo of your hard copy bank statement? Or is it okay to just take a screenshot of my online banking account? You can request this one from your bank. Thank you for the helpful blog! One question, though. The documents need to be scanned or can we just take photos of those and submit? Thanks and appreciate your response! For as long as you can take a clear photo of the document, that should be alright. I would recommend scanning tho. With regards to required documents to be attached, there’s no limit per file?.. or is it required to have a minimum 500kb per file?.. thanks for the info, but can i apply tourist visa without the bank statement? my aunt will shoulder all the expenses? thanks and I didn’t have a job can it be possible? That is possible. If your aunt will cover all your expenses, your bank statement is not a problem. But if you have any amount in the bank, I would suggest that you include it no matter how little it is. As for the job, well, some people get their visa application denied because they have weak PH ties or not enough reason that you’ll go back to the PH. Hello…..i just want to ask if same on mine ..i dont have any property or own a Business like having business permit…..i have only friend there in australia and hes the one paying for all ….what should i do…hope theres someone give some advice on me. Hi hope u cud help me….  i am applying online and i am in the portion of attaching the files…. i scanned the documents using adobe and saved it in the icloud drive of my ipad…. however, i could not access or click on the files in my icloud drive to attach these… what could be the reason?…. i used the same procedure and files for my new zealand visa application and it was fine…. thank you in advance! good evening, can i ask po kung paano process po ng pag bayad ng visa fee for tourist visa sub 600.. i am planning to apply my visa by next week.. thank you. Hi! Thanks for the useful info. Anyway, I’d like to ask if having a medical examination is strictly required in all cases? Will my application be denied if I didn’t take a medical examination? I’m just staying there for 6 days, yet the examination will cost me 6000 bucks. Thanks! Hi . ask lang ako if makakakuha ba akong ng visa sa Australia ? Unemployed po kasi akong as in sa bahay lang ? E yung friend ko sa Australia yinayaya akong magbaskyon ng 10days? Pero diko Alan paano ako makakakuha ng visa? Wala din akong pera sa bank account na malaki? Maibibigay ko lang is I.d and birth certificate … Pero yung nag invite sken na friends ko sagot nya lahat expenses ko dun roundtrip ticket ko as in lahat. Paano po ba ?? Help naman po…. Reply pls. I need your advice po Im planning to lodge my tourist visa to Oz soon. I’m self-employed ngayon, but i have yet to complete my business registration papers. Wala naman po kayang problem if ever newly-issued lang yung isa-submit kong documents? Also, aside from DTI and Mayor’s Permit, what other documents ang pwede pa po iattach? Thanks!! Hi Fhemie, I think it would raise questions. But if you have other ways to prove that you’re earning (invoices, ITR, etc. ), those would help. Hi. I’m pretty much ok with my application. But they’re requiring past travel documents to be attached. The last time i travelled out of the country was back in 2010 to HK. Do you think it’s really required? Also I was declined for a US visa in 2010 as well. Should I declare that in my application? Hi Chris! You can submit your HK trip even if it was in 2010. HI! applying visa next week, i would like to ask if you could help me or can i use your submitted cover letter as a pattern? And can u share your itinerary and hotel? Hi just want to ask if ok ba na isubmit ko yung 2 nso cert. Of my 2 kids just to make sure na i’ll come back? Wala kc akong work but i have credit cards extention of my mother in law in the states? Hi, how long did you wait for your visa to get approved? Hi Yoshke! I hope you can help me. I have a question kasi. I’m filling out an online application form and I’m being asked what is the relationship between me and the one who will support my travel. Since my boyfriend is the one sponsoring my trip I was hoping I could choose “friend” to best describe the relationship. I could’t find friend on the drop down list. Do you know what could be the problem? Did I miss anything? This is page 13/20 on the form. Thank you! It’s okay. Another question, is it okay if I submit 3 recent payslips instead of ITR and one bank certificate to establish that I am working and have a personal savings? Pang additional evidence lang. Thank you! Hi koleen…where u able to get australian visa? Hows the process going? I want to ask what relationship did u put on ur application? Thanks. You Should specify as “boyfriend” dear. Hi Julie! Here are my answers. how much the minimum amount of money to show in the bank statement? —- I dunno. They don’t explicitly say. But to give you an idea, the embassy of France requires 120 euro per day from Schengen applicants. Maybe you can use that as basis to get a ballpark figure? How long u’ve got ur approval letter? — Almost a month. But this was in 2015. It’s much shorter these days. Some get theirs in 1-2 days. Is it okay to put there 2weeks planning to stay in australia but my real intention is t stay for 2months? —- We always encourage being truthful in visa applications. But we applied for a 3-week stay and were granted a visa valid for 3 months. Screenshots? I dunno…. Parang hindi since it can be easily altered. Hi! Is it necessary to have all documents notarized? Hi, perhaps someone may be able to help me with this, I am an Australian, previously working and living in Malaysia and still currently residing , or staying there, (in Malaysia) for an extended holiday on a tourist visa. I wish to take my girlfriend, who is a Filipina and who is currently working in Malaysia (as a maid) though, not my maid, on a trip down to Australia. Obviously I will be financing the trip and all her expenses will be covered by me. Does anyone know from perhaps a similar situation whether there maybe difficulties in securing the visa. Peter, better inquire or ask for assistance with your embassy or consular office in Malaysia. Hi! I would be applying for tourist visa this month. I’m planning to lodge my application online without going thru an agency. I’ve scanned all the requirements. May i know what specific documents need to be notarized? Thanks! Hi Rus! There was a note that the passport copy had to be notarized when we applied. Not sure if that’s still true now. You’ll know when you begin your application. It’s usually indicated on the application dashboard. What if I have Australian sponson who is not living im Australia? I have Australian bf who wants me to travel with him to Australia for a holiday. Hi Gie. Yes you can. The application is 100% done online (unless you’re summoned). Hello, ask ko lang po kung paano ma.affix yong signature ng applicant through online application. Do they ask for medical if 3 or 6 months holiday only? May I ask if to whom should I address the cover letter if I’ll be applying online? Hi Yoshke, this article is very helpful! Thank you for writing this. Anyway, I have a few questions. I’m planning to visit my aunt in Australia in 2019 with my husband and baby (less than 2 years old). I’m working online as a freelancer and my only proof of income is my PayPal account – I get paid weekly via PayPal. Do you think I can I use that as my proof of income? I don’t have BIR yet. Just a note, my husband has a stable office job with good salary and I have a bank account with quite a good amount of savings, almost 1M. Do you think there’s a chance that we will be approved? Liza, your hubby should be the Primary Applicant. 1) will it be individual application in cases for family with kids? or husband and wife? or there is group application? 2) if individual, there is a chance that one gets approved and other/s not. One member can apply for the whole family. According to the Immi website: Yes. ImmiAccount will let you submit multiple online applications and pay for these applications at the same time. For example, if you and your family are applying for visitor visa applications, one member of the family can create and manage all the applications through their ImmiAccount, and pay for all these applications at once. Payment can be made by credit card in Australian Dollars (AUD) for all online applications submitted through ImmiAccount. Hi Liza, as far as I know, you can make multiple applications using one Immi account. You can also create a group on the dashboard (just click on “new group” and then take note of the group code) and then when filling out the application form, at one point you will be asked if it’s part of a group, click yes and enter the group code. Hi. Just want to ask po if ok lng ba ilagay names ng friends to visit/contact in australia? Should i still ask for a letter of invitation from them or any proof that i know them? This is a self funded trip po pero pano po kung nag offer din po ng accomodation sa place nila what document po ang ibbgay sa embassy? I hope you can help me po. Thank you so much! Hi Lei, if you’ll be staying at a friend’s house, it would be best to submit a letter of invitation talaga. Best if in the letter, maexplain ung details ng trip and how you know each other. And yes, you can also submit proof of your relationship. Hi! Ive read through your article on AU visa and was wondering if having a Japan visa (recently expired) would be a plus? Coz I’m planning to reapply for a Japan visa as well, for the multiple entry. Planning to take my parents to Oz. Never been there but I want to go with them. Problem is, they don’t have any proof of income, not even bank accounts. I am working abroad and of course would sponsor them as we travel. How do I apply for them? Also, is medical exam required upon application? No, medical exam isn’t required. How old are your parents? Are they senior citizens na? Hi Po, been following your posts at dami ko nakukuha tips sa travels ko and thank you so much for that. We have plan to visit Australia come July 2018 with my husband, our 2 yo son and 2 of my friends. 1. Separate immigaccount po ba yung sa husband ko? Di ba kami pwede magfamily application? At paano yung sa anak ko. 2. Kaka-start lng kasi nung business last year, so it will appear sa ITR nya na masyadong mababa lang binayaran nya. Makakaapekto po ba ito sa application nya? Meron naman syang DTI, Mayor’s Permit, Business Permit, sufficient naba ito or need pa talaga ITR? 3. May invitation kami from an Australian friend (former workmate -Pinay wife and also a good friend of ours) and we will be staying in their house in Perth, but after Perth mag-Sydney kami before going back home sa Philippines. Wala ba maging problema if ang invitation sa Perth lang? 5. What about my 2 other friends, separate po ba application nila? 6. Mga magkano po dapat nasa saving account for sure approval for 1 week trip to Australia? 1. Group applications are allowed under 1 ImmiAccount lang. 2. Hindi naman required ang ITR. It will be helpful kung meron pero di sya required-required. Since married kayo, I think okay lang, explain mo na lang in a letter na you’re working abroad and your husband stays at home to take care of your son and a business, and that this is a family trip. 3. Up to you if you want to mention the Sydney part. Ideally, you have to declare that, but if you do, it would be great if you can also submit your day-to-day itinerary and hotel booking in Sydney. 5. Not sure if okay lang isama sa group application pag hindi relatives. I haven’t tried. 6. No one knows. They don’t say that explicitly. Hi. Thank you po sa response. Follow-up question lang po. In the online form meron po question about National Identity Card. Ano po ba ibig sabihin nito? Ibang country po na na identiry card? I don’t remember na pero I think NA lang nilagay ko dun kasi wala naman tayong national ID. Thank you po. What about this question? Does the applicant have any members of their family unit not travelling to Australia who are not Australian citizens or Australian permanent residents? Pasensya na pero hind ko kasi macomprehend yung question. Thank you again. One last question po. What about this question po? Yung Form 54 – Family Composition ay required din po ba? May I ask where can I reserve my flight? Your blog is very helpful. I used your guides sa mga trips ko abroad. Question ko lang po about Australian Visa through online application. Since walang visa stamp/sticker na bibigay ang embassy, what if let say mag apply ako ng VISA for Schengen, how will they know na nakarating na ako sa Australia? Confused lang ako. Thanks in advance po sa pagsagot. Pls update this post, as Australia no longer stamp passport upon entry nor exit . The only evidence of your Oz travel is copy of your boarding pass and ofcourse photos. Hi! Yup, thanks for bringing this up. I just arrived from Australia last weekend and yeah, they don’t stamp entry or exit anymore. I yoshke! Thank you for the blog. The family and i are planning on a trip to melbourne for my cousin’s wedding this october. May question lang po ako, invitations are already in order with my name as part of the entourage. In my passport meron akong “Ma. Elizabethl.” Pero sa NSO brth cert ko wala yung “Ma.”. ok la g ba if i submit along with my NSO birth cert yung baptismal cert and a notarized document of one and the same person? Thnak you for your reply. Does anyone here have applied AU Tourist visa through VFS? If you don’t know anyone in Australia and you’re going there as a tourist, you don’t need to submit an LOI. If it doesn’t apply to you, don’t provide that doc. Maraming Salamat po, ano po kaya pwede Ko isubmit instead? 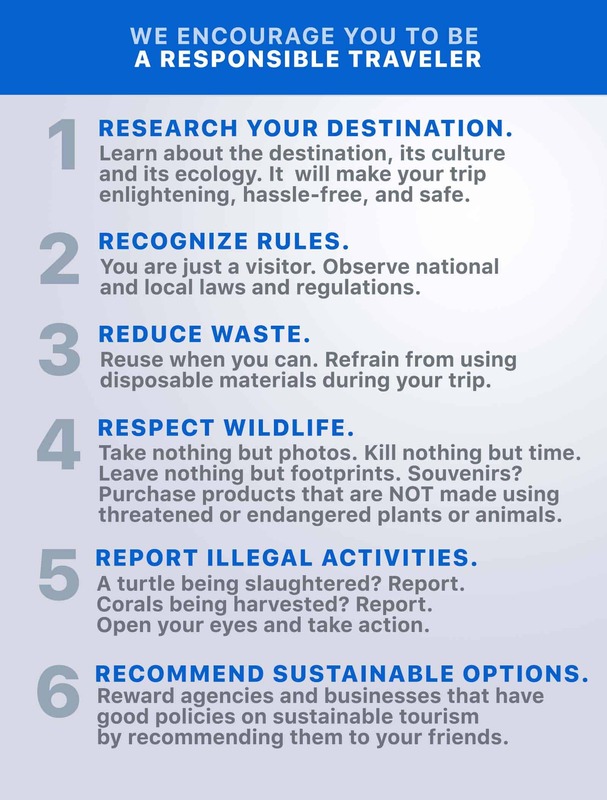 Pwede po kaya yung mga itineraries na pupuntahan Ko na mga tourist spots? Please reply po. I’m not sure if you’ve read the post properly. If you’re not visiting anyone, you don’t need to provide a letter of invitation. And yes, you need to submit your daily itinerary if you’re applying as a tourist. It’s in the list of requirements I provided above. Please read. I’m just wondering, do the documents have to be notarized or certified before submitting? I don’t know what they mean by certified. should i also need to get an appointment and submit the documents at VFS office Makati, after i fill-out my immiaccount? Hi Kim. Not sure I understand your question. The application I explained above is done completely online. No need to schedule an appointment. All requirements have to be uploaded to the Immi website. What other documents are you referring to? My sister along with her husband and children is planning to apply australian visa online as a group, pwede b akong sumabay s group application nya? I read your article before lodging my application online, it helped me prepared for it. I just received the good news (just now!) that my visa application has been granted! I got it after 12days of waiting, 1-yr multiple entry, 3mos/entry. Congrats! Did you lodge your application online? I am still waiting for my results and hopefully I’ll get a response soon. Hi Gab! may I ask, did you specifically state na you’re planning to go back to aus or requested for a multiple entry visa? I read your article and I would like to ask po, My boyfriend sent me an invitation letter which his intend for me to travel is on May 1, which is today, However hind ko pa na lodge on time sa immiaccount ko kasi po nasa province ako and ang internet coverage is very slow sometimes wala po, Can i still lodge it kahit and naka lagay sa invitation is May 1 and most probably malodge ko lahat ng documents i think bukas? please help. Thank you. And also this is my second time napo, first nag ask ako ng help from travel agency and i was granted single entry, then i want to try this time online application kasi ang mahal po sa agency 25K, please help. salamat po. [It’s just one of the many documents I submitted], visa application was granted. Hi Anno, baka you can get another letter from your boyfriend. I think you can still lodge it naman but it just might raise some questions tapos mag-start ng doubt. Hi Yoshke, I really like your post. Thank you so much. It is very helpful for my desire to visit Australia. Let me ask cuz I’m planning to go to Melbourne just for a week this Mid August, is my funds for 200,000 is enough for this do you think? And I will be doing the process this week. hi! how do u apply as a family? everyone should make an immi account? Oh Im so happy to get a reply. Thank you soo much. I’ll be there for just a week. Thank you for your time in advance. I’m currently working now with my application. I have another question. I got BIR 2307 from my employer that shows my tax charges and the amount of salary too, Do you think this is enough? An ITR cant be served instead I need to ask it from BIR with a charge. Secondly, do I need to notarize the documents? Third, My passport name is maiden, with the DFA approval, I’ve separated 9 yrs now but not yet annulled by paper, do you think, the embassy still beed to check on that? This is something to do with IDs I am submitting, both under married and maiden names . 1. I don’t know if that’s enough. Visa application approval involves a lot of factors: funds, employment, rootedness. I think if you have plenty of other proof of income/employment/rootedness, okay lang yan. 2. There was a note that the passport copy had to be notarized when we applied. Not sure if that’s still true now. You’ll know when you begin your application. It’s usually indicated on the application dashboard. In our case, we didn’t have our docs notarized but they were accepted. 3. Usually, a quick remedy is just submit a copy of the marriage certificate to explain the different last names. I don’t know for sure coz I haven’t experienced it. what is the longest visa we can get? can we get a multiple visa say 5 years or 10 years? i will be traveling with my wife. I have filled up the online application and was asked for my traveling companion. I end up until i submit my application. but i can’t see anything on how to attach the details for my wife. separate ba ang application nya in a separate IMMIACCOUNT?? kindly email me your reply. i might not be able to return to your blog site. Hi! Not sure exactly how to do group application because I haven’t tried it myself. I just know that it’s possible. hope this will help…i was also confused with that travelling companion part….but when you click on yes and i believe it will ask you to enter the details.it will indicate that a separate application needs to be submitted for that person.in your case your wife.. I submitted my application may 9 and just received the visa today may 18 and multiple entries was granted. I only have 5000aud sa bank..and hindi certified copy ang sinubmit ko. I only scanned my current and old passport….the rest of the documents,i only took photos /picture of it.as long as clear naman yung copy…and screensht yung iba.maybe case to case basis.maybe ok lang kc they accepted it. Hi, okay lang kaya if screenshot lang un mga payslips and other paperless transactions? Hi Tine, yung sa akin downloaded na payslips, so halos same lang sya ng screenshots. Na-approve naman. Pero halos extra ko na lang yung payslips kasi meron din akong COE, ITR, bank cert, etc. Okay thanks!! Last question: is 200k enough for 2 adults, 1 infant for 8 days? Minus my plane ticket since my employer invited me. Will they send you an email if your visa has been granted? Or is it in the immi account? Hi Rovinni. It’s in the immi account. Wow thats helpful, so I’ll just generate bank statements from my online account. I think that would do it. Thank you so much for the reply. As always your ideas and knowledge are a good help. More power Yoshke Dimen!!! Hi Yoshke. Considered pa ba kami for a group family application kahit kaming magkakapatid ay 18 years and above o kelangang individual na kaming mag-aapply? Hi Raymond, I’m not sure coz i haven’t tried group application myself. But I think pwede naman yan kasi immediate family pa rin. Again, not sure. How do you know when a document is “required”? In my attach documents menu it just has “Additional documents” there isn’t a required documents menu, do you have a picture of what the menu looks like for required documents? Hello po., patulong naman po.. I’m applying for a tourist visa under sponsorship, I’m just confused saang field q po Ba i.attach ang cover letter q? Thank you so much for this blog it’s really helpful! I have a question po. My boyfriend and his family will cover the expenses (transportation, food), and accomodation (may house po sila dun) of my vacation in Australia this coming December. Pinoy po sila na citizen na dun. I’m a little confused po with the online application. Since sponsorship po is not available for friends/bf but only family lang, should I put “Self-Funded” ako and then just explain po dun sa explanation bar below about how I would support myself and that my bf and his family will support me? Or no need po to explain about my bf and his fam supporting me on that page and just attach documents and letter explaining that they would support my stay? Tho I would also showmoney po so basically, I could support myself in terms of buying souvenirs and food hehe. Also, do I really need to have all the documents notarized po? Including yung mga invitation letter and supporting documents ni bf and fam? I’m a little confused din po dito. Is it okay if all the supporting documents he will send me are soft/scanned copies? Of he needs to send it to me via courier pa before I could apply? Sorry po if I have a lot of questions. It’s my first time din kasi. Sa visa applications in general, if may sufficient personal funds and proof of rootedness/employment ang applicant, mas madaling maapprove ang self-funded trips kasi it’s simpler. Thanks for the response! Just an additional question. I’m not sure where to put my Cover Letter, plane tickets of future trips (since I could use these as a strong reason of going back to PH), our photos together of the person who will sponsor me. May I know which area I should upload all these? Thank you! I haven’t applied yet. I’m planning to do it by the end of September pa since I’m planning to fly on December pa naman. Did you lodge your application already? 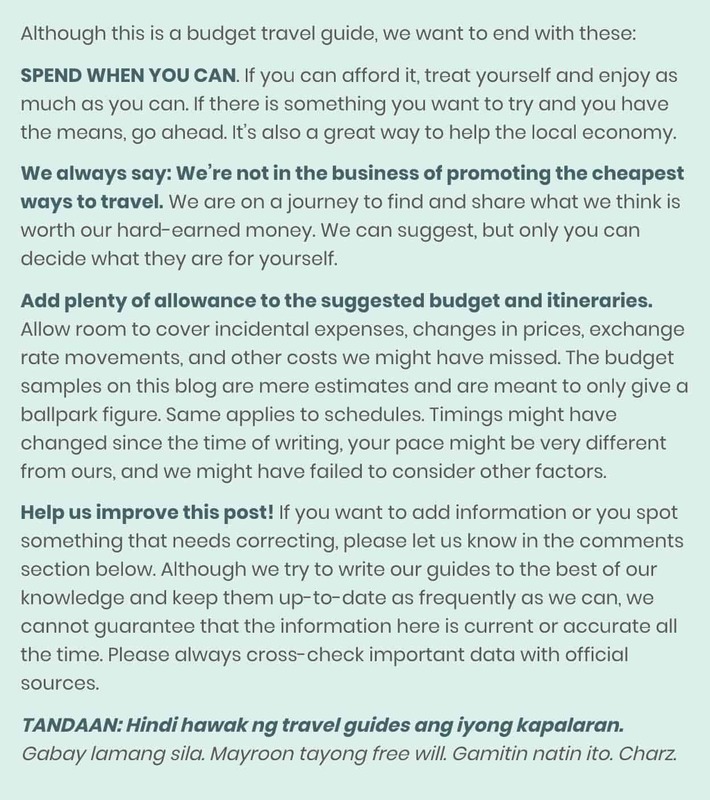 I talked to other people as well about this and I was informed that it’s okay to put Self-Funded and just explain dun sa “Details on how travel will be funded” that my bf will sponsor me. Was your visa application granted? I tried the same for my boyfriend but I know where I went wrong (didn’t provide evidence of his funds and only my own). Would love to hear your experience and advice. Just create an ImmiAccount and then make multiple applications using that account. You can also create a group on the dashboard (just click on “new group” and then take note of the group code) and then when filling out the application form, at one point you will be asked if it’s part of a group, click yes and enter the group code. Hello, I’ll be visiting my husband in Sydney who has a temporary working visa. (On shored by his company here in the Ph). We are planning to go back here in Ph together. Do I still need an Invitation letter from him? Thank you! You can add a letter. You can even add a copy of her senior ID to prove it. Then bank cert din to prove funds. Good Day. Visa grantee na kami last year pero expired na this year. mag aapply ulit kami and may mga kasama akong minors. need parin ba ng DSWD travel clearance kahit may mga passport na sila? They will travel without their parents parin, same thing last year. Thank you sa sagot. Need pa rin ng Immigration ng DSWD Clearance basta walang parent na kasama. Thank you for the anwer Yoshke! Another thing is do we need to create individual immi acount or can I use my own account, make a group and apply their visa so i won’t need to open multi immi accounts upon application for our group. BTW I am our group coordinator that is why I will be doing all the application. Thanks in advance. Hi Mik. As far as I know, you can use your own account. Just one account will do. I haven’t tried doing it in just one account though, so I’m not that sure. But I think it’s possible. Thank you very much. Nag send na ako ng request to koin the group. ITR is not required, but strongly recommended. However, if you really can’t provide, make sure you have other proof of employment and rootedness to submit. Hello what if me and my husband will apply for visitors visa, do we need to apply separately? Is there a way that we can apply together? on the 20 page Elodgement page, medyo naguluhan lang ako sa significant dates. Kailangan ko din ba ilagay yung place kung nasaan ako on the significant dates? nag ask din sa tourism ng significant dates. purpose ko lang talaga is for vacation/tour. maybe pwede ko ilagay siguro yung individual date and kung saan ako pupunta. 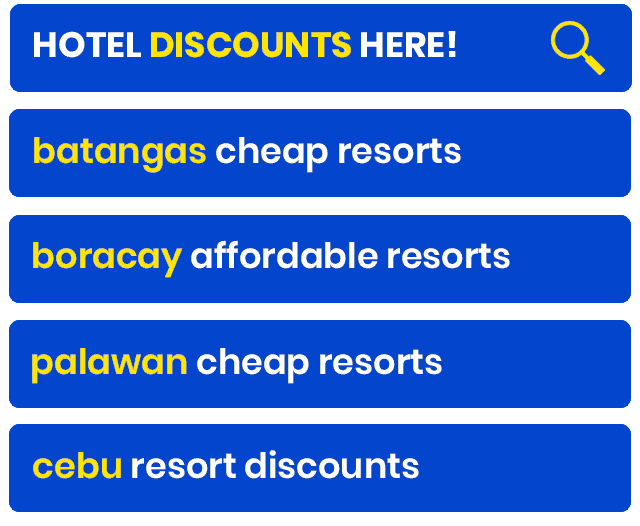 iba pa siguro yung pag nagpasa ka ng detailed itinerary? Ganun na lang talaga gawin ko. date and places to visit. appreciate the help, thank you very much. No problem! Good luck with your application! Any idea if there is additional fee if multiple ang i rerequest? Kasi mag sside trip kami to NZ from Sydney. Tas after NZ, babalik kami Melbourne – any changes sa requirements or fees? Hi Ju. I’m not sure if merong additional fee pag multiple. I think same lang. If you’re applying for a multiple entry visa, just make sure that your requirements clearly show the need for multiple. For example, in your submitted itinerary, make sure it shows that you’re exiting Australia for New Zealand and going back again. This way, the need for multiple is justified. Kindly help me what is supposed to be included in the non-accompanying members of the family unit. I am already married. Am I still supposed to include the names of my siblings? Or is it no longer necessary? Thank you in advance. Hi Patrick, this is on the application form, right? Hmmm I never had to deal with that part of the form because I’m single but according to other forum sites, it refers to spouse and children only. So no need for siblings info. Yes Yoshke. It is in the application form. Thank you for the response! If you have like 10 passports and a lot of travel within each passport, do you have to scan all of these pages? Thank you! Ideally, yes. Although in my case, I may have skipped some pages. Haha. Hi.. im planning to apply for australian tourist visa this month.. as i read ir post its stated that we need to submit evidence of family composition.. does this mean i need to submit psa birth cert of my parents and siblings or just mine as the applicant? Thank you! Ur rsponse is highly appreciated. Hi. It’s not required. I submitted just my birth certificate on two occasions. Both times, my application was approved. Hi! very helpful tips on how to apply visitor visa, i just want to ask a favor if you can make a cover letter for me, here’s my email add: jhingpot03@gmail.com . I really appreciate your help. Thank you. Uhm, no. Best if you write the letter yourself because you know the details and the purpose of your trip better than anyone else. Hi I would like know what did you put here? Enter the details of any national identity documents issued by a government other than Australia. Hi there! Our family of 4 plans to apply for an Australian Visa. Do I need to create an Immiaccount for each us? Thank you. Thank you. My sister and her family are now in Sydney but they are not yet permanent residents there. We will be staying in their rented apartment if we push through with the trip . My question is, would it be okay if I will submit an invitation letter from my sister upon applying for an Australian visa kahit hindi pa sila PR doon? Thanks. Hello There , Good evening to you , i already lodged my application online for my Visitor Visa Subclass 600 last June 30th and i am still waiting the result my only problem po bago yong passport ko at nakalimutan ko po na wala pa pala akong signature sa new passport ko .may idea po ba kayo ano dapat gawin?Just worried baka ma denied ako until now wala pa din silang update ..Thank you . Hi Nelia, kami, sa family docs namin isinama (under Recommended). It’s not required. But it’s recommended. Yep, you can still submit without it. But chances of getting approved are lower compared to when you have a travel history. 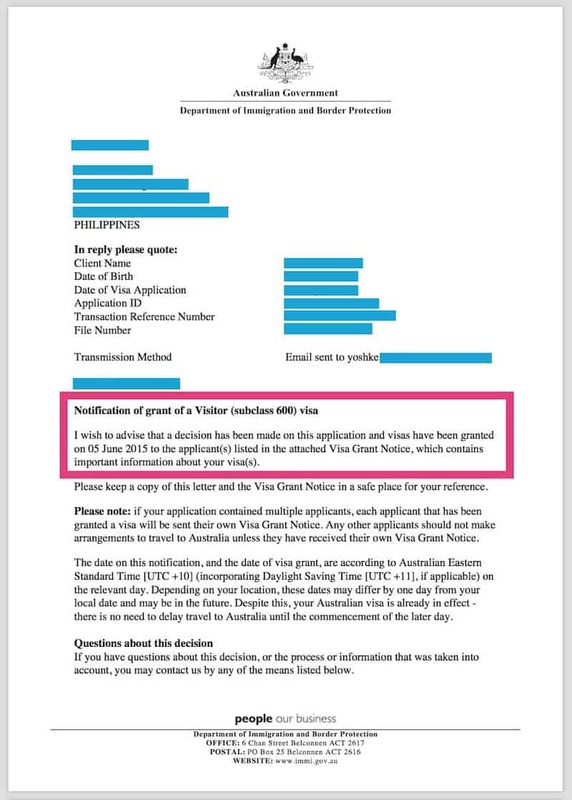 hi, I need some advice regarding applying for a tourist visa with my fiancee and we are currently working here in Qatar and we are planning to take vacation 20 -25 days to my brother in Melbourne is it possible I can apply together or accompanied by me? Hello i have a query? ?..is it necessary for the passport size pic to get notarized?? Hi! Thanks for the detailed info. Anyway, I just want to clarify the definition of ‘newly employed’ that you mentioned under ‘The reasons why my application would be denied’. Is it a month prior to your intended trip? I’ll move to a new company by next month and it is 5 – 6mos away from my trip. Would you know if it would/might affect my visa application? Thank you so much in advance! Hi Mike, I think you should be fine. How long have you been with your current company? What I meant by newly employed is when it’s the applicant’s first job. If your employment history shows you have been stable (or previously stayed with a company for years), even if you’re new at your job now, I don’t think it would matter much. Thank you so much, Yoshke! I’ve been with my company for 3 years now but prior to that, I kinda hopped from one job to the other and stayed for a year or less. I even worked overseas for a year so I’m not sure if this would affect? My current job is already my 4th. But I’ve stayed here the longest. Thank you so much for your help! Hi Mike, I think that’s fine. My situation is similar to yours when I applied for Aussie visa for the first time. Mine was worse, I think. Haha. I was with my company then for less than a year. Prior to that, I was a freelancer, taking short-term jobs. So it shouldn’t be an issue, I guess. As long as the other requirements are sufficient and satisfactory. Thank you so much, Yoshke! Haha. That’s a huge relief! Haha. Couldn’t thank you enough for the tips! I’ve been to two asian countries for the past two years. Is that enough as evidence of travel history? First of all, I salute you for being so helpful with your kababayan, ngayon nadag dagan pa.
be applying hers in the Philippines. We will travel together in the Philippines. Hi Marlene, I’m not sure exactly ano kailangan kapag sponsored trip. Aside from what you mentioned, it would be a good idea to add an Affidavit of Support to further prove that you will be shouldering the cost. It’s me again. Sorry to bother you. Is there a deadline in completing the form thru the ImmiAcct? I do not see anymore the form that I filled up. Hi Marlene, hmmm, if I remember correctly, 30 days. I’m not sure but definitely not 2 days, at least during my time. It took me more than 2 days to complete the form. Thank you for all the help, na-approve ako.! Talagang yung papel na in-email lang ipapakita ko sa immigration? passport na lang papakita sa australia. too be sure na lang na i print yun. salamat ulit ng marami. laking tulong dito pati dun sa FB support group. yep print na lang din! Hello po, just want to ask kung paano po kung yung sponsor namin ay hindi taga Australia, ano ano pong adiced niyong isubmit. Tito ko po from US ang magbabayad para sa amin ng lola ko. Also, mas mababa po ba ang chances kung unemployed? Currently employed po ako, pero unemployed na ko sa target dates of travel namin dahil end of contract. Salamat po! Hi Khryss, I’m not sure exactly ano kailangan kapag sponsored trip. But it would be a good idea to add an Affidavit of Support to further prove that you will be shouldering the cost. Yes, malaki talaga chance ma-deny pag unemployed. Should I include my middle name as part of my given names? Hi. I just applied AU visa online and received a feedback that I need to do medical examination. Well it’s actually my third visa, if granted, and this is the first time they required me. Do they have a new rule this 2018 that you need to undergo a health examination or is is only becuase I will have more than a month vacation in Sydney? You r answer is a great help for my sister’s future application. Thanks a lot! Hi Bee, I just had another Australia trip this month and applied for almost all of my friends, and none of us were asked for a medical exam, so I’m pretty certain it’s not the norm. Baka nga because more than one month. But I’m not sure. Hello, I have the same requirement. it will be my third visa also if granted. I am still waiting for the decision. Question: did you ever do the health examination? and Did they reach out to you that you need to do it? This article is incredibly helpful. I just have a few questions though. 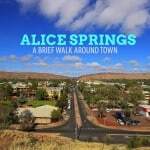 I’m a freelancer, one of my bosses will sponsor my trip to Oz for 3 weeks. He lives there and has a valid business number and whatnot. He just needs to send a letter of sposorship and proof of his financial capacity, right? I also think I might have issues with proving I will be back. I am only renting (though I have a contract), and I have another client here who can issue a COE to me if I need it. I have properties, but they aren’t in my name yet. Would those suffice as proof that I will return? Regarding proof of rootedness, you can’t submit papers for properties that aren’t in your name. It will just raise a gazillion more questions and they might suspect your sincerity. Not sure what else you can submit aside from COE. If you have a strong travel history, there’s still a chance of approval. Hi Yoshke Dimen, ask ko regarding bank documents iba pa ba yung bank certificate and bank statement need pa ba yan ng stamp from the bank kasi dito sa qatar pede namin ma generate yung bank statement ko. Hi Glaiza, yes, magkaiba ang Bank Cert and Bank Statement. Di ko alam about stamp, kasi sa pinagkukunan ko na bank, may signatures lang ung bank cert. Yung statement naman na sinubmit ko, walang stamp or signature pero printed sa letterhead nila. Baka pwede naman na ikaw maggenerate ng statement online kung yun talaga sistema ng bank mo. Pero sa certificate, baka need pa rin ng may sign. so need ko mag submit ng bank statement and bank certificate? yun ba ang required sa financial documents for tourist visa both tlga need nila? Hi Glaiza, bank statement lang. But again, the more docs you provide, the better. kailangan ba ang bank statement ay may stamp? Hi. I’m an OFW here in KSA. Will it be okay kung sa Pinas na lang ako kumuha ng tourist visa pag nagbakasyon ako? Kasi less hassle. Dito kasi kelangan pa ng mga biometrics, exit re entry visa, etc. thank you. Pwede naman, pero online lang naman buong application process. Also, pag nagcreate ng Immig account, ilang days dapat bago isubmit? Will it stay there for a couple of months? Thanks. It will stay for a few years. Ung s akin andun p rin until now hopefully i can submit it this month. Kasama ko kc parents ko and minsan nagkakasakit sila kaya medyo natatagalan pag submit nmin. hi! i jsut want to ask kung nagrequire paba ng medical screening bago ma-grant ung visa? Usually hindi. Pero may mga cases na pinapag-medical. 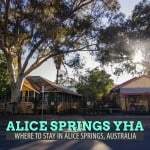 Yours is the blog I really read when it comes to travelling. You are straightforward, honest, respectful and humble. Your page is very helpful and thank you very much for that! and for us your readers, benefit from your experiences. GOD speed! Thanks so much for taking the time to write this, Maria! hi! were u required to have a health insurance prior to travelling? My sister will be graduating in October sa Melbourne . Ngayon, my parents will attend her graduation, gusto ko din sumama sa kanila. Since housewife ako (not employed), parents ko ang mag proprovide ng expenses for the whole trip. Ask ko if i need cover letters (each) para sa mga family members na sasama sa Melbourne sa pag aaply ng visa? Do you think getting a New Zealand or Australian visa is easier than Schengen or Canadian visa? Or could you please rank them from the most lenient visa policies to the least? Thanks! Yes, definitely. Aussie visa is much easier to get that Schengen or Canadian visa. Schengen is the hardest because most embassies (not all) require an interview. G’day! I have learned a lot info from you. I would like to ask bcoz im very confused regarding the notarization…I will be submitting / to upload my scanned doc’s like PSA bithcertificate, bank statement, tittle deed and COE this are all true copy, should i still have it notarized? When I applied recently, I don’t remember seeing any instruction that the docs have to be notarized. I didn’t have my docs notarized when I applied both times. That’s also what i think…thank you very much and more power! God bless you. Hello po, Janvhic here from Alabang. question lang po. Kasi in my case 1st time ko po lumabas ng bansa if ever. iinvite po ako ng asawa ng pinsan ko papunta don sa Australia. Ok lang po kaya yon? Baka kasi tingnan nila ang passport ko eh wala pa akong travel history out of the country and ask ko sana kung magkano ang need na laman ng bank account ko if ever? Thanks po. Hi Jhon-vic, yes, tinitingnan nila ang travel history. Nasa list of requirements nila yun. Dun sa magkano ang laman ng bank account, nasagot na namin sa FAQs sa taas. Pabasa na lang po. I applied for tourist visa last Monday (Aug 20) and to be honest this ‘waiting game’ gets me frustrated like crazy! Hehe. I was expecting for something like within 2 days I would receive the grant approval notice. Though I am confident it would be approved but still we would never know, right? I have been to 16 countries and am employed with the company I have been for more than 6 years now. Never been to Oz though. Hi Danny, I completely understand. The last time I applied, my friends got their visa before mine was released so I was pretty nervous. Haha. I just received my multiple entry valid for one year Australian visa today (5th-Sept). Thank you for this blog. Sobra pong nakatulog! Yay! Congrats, Danny! Enjoy Australia! Hi M! As of now (Sept 3), di pa! And I’m dying…. All the best to both of us! Hi Danny, May i know what are the docs that you submitted? Quick question, would it be a problem if I applied for a visa with complete requirements but I haven’t been out of the country yet. I’m kinda nervous and worried. Hi Donald, travel history is one of the things that they look at so it matters greatly in their evaluation. That said, cases wherein first time travelers were granted a visa are not unheard of. It depends on the strength of the other requirements and, I think, the purpose of travel. Hi, Yoshke Good afternoon, I really appreciate your page. I have some confusion about the name. The given names on the application. Do I need to add my first names and the middle name or just the first name? and for the middle name, where do we add it? Hi Ghaby, I didn’t enter my middle name. I just wrote my given name. Hi there again. I have another question, I hope to get a clear view. If Im planning to visit there by November 1-8 , would it be okay to submit the application earlier this September? Is it a good timing or the range of time is not enough? Hi Ghaby, I think it’s okay. Processing can take a day to a month. My first visa was valid for 3 months. Second visa was valid for 6 months. If you apply in September 1, the validity of the visa will either be until December 1 or March 1. Either way, your November 1-8 travel date will still be well within the validity period. wow thats a very nice reply from you. you are helping a lot of people too. thank you so much. Based on the entered passport details, applicant _____ is not eligible to apply for this visa using this online service. Ensure the passport details have been entered exactly as they appear in the applicant’s passport. The applicant will not be able to continue and should review the eligibility information on our website. Hi Marie, no idea. First time I heard about something like this. Hi do the documents you have to submit, bank statements, psa, marriage certificate etc have to be notarized or as is is fine? thanks for how you will reply! When I applied recently, nothing in the list of requirements indicated that the documents have to be notarized. I didn’t have ours notarized. But our application still got approved. Thanks for finding time to reply…I reread the article and saw this all caps in bold letters pertaining to notarized docs at the end… oops! super sorry for missing that one out and thanks for being patient to our redundant inquiries :D God bless. Do you think insurances from Manulife, sunlife and bank certificates/statements could prove strong ties with the country? thanks! Family Composition — when traveling with family using a group application, did you upload all the Birth Certificates apart from yours? Did you choose OTHER as Document Type for this then specified Birth Certificate? Dun din sa group application. I haven’t tried applying as a group kasi. Individual application ung ginawa ko so I only uploaded my birth certificate. May I ask where did you upload the birth certificate? It’s recommended that u submit that. Any reason bakit di ka makakasubmit nung form 54? How many days before na-approve application mo when you applied for tourist visa for the first time? when ka ba first time nag apply? what year? and yung 30 days kasama na weekends dun? 2015. Yep, that’s 30 calendar days. This month, ang average processing time ay 23-27 days. Medyo malaki kasi ang volume ng applications ngayon. did you scan/upload the back of the photo pa and sign I-t? Kailan ba backview ng photo signed and scanned? and regarding sa passport, info page lang yung skinan mo? Hope you can reply and help. Thanks! Hi Karen, yung ginawa ko, I just uploaded the photo tapos yung file name ay yung name ko. For the Travel Document requirement, yes, yung info page lang yung ni-scan ko. But for the Travel History requirement, I scanned din all the pages with stamps and visas. Evidence of the applicant’s previous travel	paano po gagawin? Hi Aldrin, naku, di ko alam paano gagawin kung wala pang travel history. Ang pwede mong gawin, pwede kang magvisit muna sa visa-free countries. Siguro pwede ka ring gumawa ng letter explaining bakit wala ka pang travel history pero mahirap maapprove yung ganun. I applied Aug. 23 and visa approved just today. However, it doesn’t mean that travel history does not matter. It matters. Whether or not the application will be approved or denied is based on a whole lot of factors. And travel history is one of them. Yes, it does not guarantee approval — nothing does — but it is one of the things they consider. The fact that you have already traveled abroad, even if it’s just Hong Kong, is a BIG thing already and it mattered in your application. It will be a lot harder if you have ZERO stamps. There’s a HUUUUGE difference between having 1 stamp and having NONE at all. Having a stamp, even if it’s just one shows that you have experienced going out of the country and returned. That 1 stamp mattered. Does that mean na kapag wala kang travel history, automatic denied agad? NO. There’s still a chance of approval. What we’re saying is, the chances are lower. Hi there Yoshke, its me again, please share me your expertise on the application process. On which part of the attachment field I must be attaching the letter that will serve as my letter of intent like the GTE explanation. In thinking its on the “Evidence of planned tourism activities in Australia ” under others together with the Itinerary and Planned Activities Am I right? Please share your ideas Thank you in advance. Thank you so much for the confirmation. More power to you. Sponsor naman nya ako papunta dun okay lang kaya yun? passport stamps help but does not really affect outcome of approval.. i for one was only able to travel once abroad and only to hong kong but was granted a one year, multiple entry visa. Hi Yoshke. Does the process purely online? No need for embassy appearance? Thanks. Hi Faye, yep. Everything is online. Hi Yoshke! I have a question. I have an unused Japan and Korea Visa which got expired recently due to vacation leave issues from my employer. I do have other passport stamps from SG, MY, TW, HK, and used Japan Visa in 2017. I’m planning to apply AU visa next year, can I include unused Visa under travel history? Thanks very much po and take care. Hi. My brother, who is still a student, is applying for tourist visa online. On the immi online form, there is a page that asks for his student course details. What we don’t quite understand are the “date from” and “date to” portions. Does “date from” refer to the exact date he first enrolled in uni or does it only refer to the date of enrollment for the current sem? What about “date to”? Does it refer to the date he is supposed to graduate or does it only refer to the last day of classes for the semester he is currently enrolled in? He doesn’t remember the exact date he first enrolled and there is also no way for him to know for sure his exact date of graduation considering that the academic calendar for 2020 has yet to be released. Been trying to read up on this but couldn’t find an answer. Hi Kaye, I don’t know exactly what data they need since it’s outside of my experience. What does that section ask for exactly? Verbatim. The below is how it appears on the form. Give details of the course the applicant is undertaking. I’ve decided to email the embassy since I really can’t find any information about this. Hi Kaye, yay, great that you emailed the embassy! But in case they don’t reply, hmm, if I were in your shoes I would enter the date of the first day of classes in that uni. Regarding “date to,” if there is no definite last date yet, I would just enter a date within the month where the last day or graduation usually happens. Unfortunately, I haven’t received feedback yet so I think I will just follow your suggestion. Regarding Form 54 on family composition, is there any specific requirement as to who should sign as witness? Hi! Is ITR really required? I work online and I think I can provide everything including the title of deeds ng house and car. I think I am financially capable to travel naman. But the only problem is wala akong itenerary. Is it worth to apply paba? Sayang naman kasi yung fee kapag hindi. I was denied 2x na for applying a US visa kahit invited ako ng company na pumunta dun. Medjo nakaka trauma sya. Sayang yung time and pera. Hi Magro, as mentioned in the post: you can submit just one per category. It’s ANY or ALL. In theory, you can submit just one item per document type. But of course, the more relevant documents you upload, the higher your chances of your application being approved. Hi,i am already asenior citizen and i have a 3 half sisters living in Australia they are already Australian citizen,the problem is,my surname is different from them,i am a illigitimate son,in my birth certificate was indicate that i have a single parent my mother.My sisters invited me to spent chrismas with them,could you give me a advise what i will do and what documents i will prepare,i am a an ex ofw in KSA for 20 years,and my passports are still wirh me. Hi there, I got really interested in your blog. And this has been very helpful in the lodge and approval of our family Visa (but with 1 pending application for my son). They asked for us to submit a “Certified Copy of Birth Certificate (PSA Issued)”. I just uploaded thru Immi a scanned copy of the PSA issued Birth Certificate (got from express delivery thru PSA helpline.ph) – I didn’t have it notarized anymore. Is this ok? How long would re-processing or further assessment would take? Also we already bought ticket and our flight is by this Friday already. Is there a way to follow thru? Can I call a certain number? Can I still upload copy of our ticket and hotel accomodation for them to know we’re really hoping for grant of my son’s Visa application? Notarization, did they indicate that the birth certificate be notarized? If they didn’t, then it’s okay.